I wanted to wish everyone out there a happy and prosperous new year. Here is to hoping that 2010 is the year that at least one major cryptozoological mystery is solved. I plan on enjoying the holiday and getting back to work this weekend. I would just like to take a moment to wish everyone a merry and joyous Christmas. I pray it will be a blessed time for you and your family. My very best to each of you. Lions, Tigers, and Bears...In Texas? It seems that a lot of large predators that formerly called Texas home are making a comeback here in the Lone Star State. There is also a recent report of a non-native predator making an appearance. Sightings of big cats continue to roll in from areas of the state where such animals have long been thought extirpated. Cougars and the ever-elusive black panther top the list of big cats spotted. 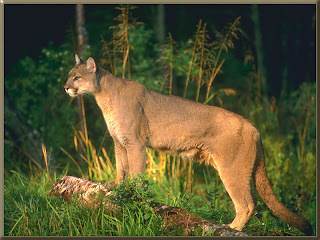 Cougars are known to inhabit and flourish in the Trans-Pecos region of Texas and deep South Texas along the Rio Grande River. The Texas Parks and Wildlife Department continues to take the position that no wild breeding population of cougars exists outside these areas. The black panther is not even discussed as a possibility in any official capacity despite a growing number of reports. Now an even scarier cat has been reported stalking Southeast Texas. Police in the Brazoria County town of Oyster Creek have received multiple reports of a tiger prowling the area. You can read the story about the sightings in the Houston Chronicle here. The article claims that Texas Parks & Wildlife game wardens have investigated the area but found no sign of a large cat of any kind. The TP&W must have taken the reports seriously as the article says they even broke out night vision gear trying to catch a glimpse of the tiger. If true, this would be an incredibly dangerous situation for the people of Brazoria County. The black bear continues to make news as it seems to be finding its way back into the eastern portion of the state. Like the cougar, black bears are known to inhabit the rough and arid areas of far West Texas. Bears did formerly inhabit the piney woods and swamps of East and Southeast Texas but hunting wiped them out by the mid 1900s. Oklahoma, Arkansas, and Louisiana bear populations have exploded over the past decade and it has long been thought to be just a matter of time before they made their way into remote areas of Texas. That time seems to be now. Bear sightings, particularly in Southeast and extreme Northeast Texas, are on the rise. What is surprising is that sightings are beginning to be reported from areas in what would be considered Central Texas. There was a nice article recently published in the San Antonio Express News regarding the come back of the black bear in Texas. You can access that article here. I would be greatly interested in hearing reports of any big cats or black bear sighted in Texas by readers. So, keep your eyes peeled as you travel the rural roads of Texas this holiday season. You might catch a glimpse of a mountain lion, black panther, or bear. Of course, if you are really lucky, you might catch a glimpse of something even more unusual. I would like to hear about that as well. Today marks the one year anniversary of the Texas Cryptid Hunter site. 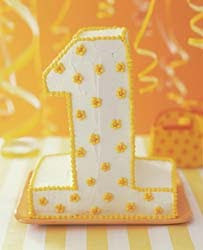 It has been a great year. I have enjoyed having an outlet to post my thoughts on various cryptozoological topics. My interests in undiscovered animals and weird creatures is not exactly mainstream. Typically, it isn't a topic you can bring up at the company Christmas party or at the office water cooler without being chastised or thought of as a bit, shall we say, "eccentric." The blog site has allowed me to open up and say what I think whenever something of interest pops up. I have enjoyed writing it immensely. I have no idea how good these numbers really are but I am pleased to think nearly 10,000 people stopped by, even for a little while, to see what I had to say. I'm sure these numbers pale in comparison to other more established sites but from what I can tell the 2:31 average length of visit is actually a pretty healthy number. So, thanks to all those who drop by and read my thoughts from time to time. It is appreciated. Now on to year two. Two nights ago, at about 10:45pm, my cell phone rang. I answered only to hear someone already in mid sentence talking about bigfoot. This gentleman continued to ramble on about bigfoot and didn't seem to take much notice of me at all. The speech was slurred and sometimes hard to understand. It took a few moments for me to realize this was the husband of the woman who made the 911 call to San Antonio police claiming a huge hair-covered creature had walked through their makeshift camp (If by some chance you have yet to hear about this incident just skip down and read my previous entry for details). This gentleman continued to go on about the incident. He said if I wanted to see bigfoot he could make that happen but only for my "own peace of mind." He adamantly stated that I should stay home if I wanted to "take pictures, write a book, put it on the internet, or get on television." I tried to interject here and there without success. After a few minutes he said his throat was hurting and handed the phone to his wife. At this point the conversation became easier to follow. She seemed lucid, her speech was clear, and I had no trouble understanding her. However, it was what she said that was a bit disturbing. She said she had had someone "check me out" by doing an internet search on my name. She said she just wanted to make sure she knew who she was talking to. If true, I guess I passed this test as she was calling to invite me to her camp for a few days so I could see what was going on. She said the bigfoot family had moved on to "another forest" and she no longer felt safe without them near. More claims were made about government vehicles emitting high frequency waves and interlopers traipsing through the area they considered their home. It was about this time the phone went dead. It could be the battery on their cell phone died. It could also be that their prepaid minutes were exhausted. In any case, the conversation, one sided as it was, ended abruptly at that point. I stayed up another hour or so to see if they would call back. They did not. I have not heard from them since. So, what is to be made from this? This witness was very convincing during the initial phone interview. She said some things that I found very interesting and compelling. Not so much about the creature she claims to have seen itself but more about the area where she was camping (a dumping ground by county workers for dead, probably road-killed, animals), the behavior of the creature (freezing until it realized it had been seen), the hearing of bangs and knocks and the alleged discovery of a stump that held a beehive, etc. (Again this is all detailed below). As I mentioned in the initial write-up, she went off on some strange tangents that raised some red flags for me. Strange government vehicles emitting high frequency waves, feeling that the bigfoot creatures were trying to communicate with her telepathically, and being able to "sense" a female bigfoot presence to name a few. I leaned toward believing her story regarding the sighting itself. Personally, I don't fall into the camp of those who believe there is some sort of government cover-up regarding these creatures. Nor do I believe sasquatches are shape shifters, have telepathic or psychic abilities, etc. However, having different opinions on these subjects has no bearing on whether or not a sasquatch was present in these folks camp that night. Things have changed a bit for me, however. Obviously the odd phone call did not help the credibility of the witnesses in my eyes but there is more. Rick Tullos of the San Antonio Texas Bigfoot Research Group posted a comment below my original write-up with a link to what he had on the story to this point. He and a fellow researcher named Ken Gerhard made their way out to the sighting location. They did manage to find the campsite the witnesses had been using. According to Tullos and Gerhard the site had been bulldozed and a fire lane had been cut through the area. All that was left were residual ashes from a campfire. They located what they feel may be some tracks but nothing else unusual. You can read their full account here. According to Mr. Tullos' write-up, the date he and Mr. Gerhard visited the site of the alleged encounter was the day before my phone conversation with the couple. During our conversation the witness never mentioned having moved their camp voluntarily or involuntarily. While the witnesses never specifically said they were still in the same location it was certainly implied during our conversation. I would think the destruction of their campsite by a bulldozer would be something important enough to mention. This, if Tullos and Gerhart were in the correct spot, further hurts the credibility of the witnesses in my eyes. It has been suggested that the witnesses may suffer from some sort of mental illness. Certainly it is no secret that many homeless people are suffering from one form of mental illness or another. Paranoid schizophrenia seems to be by far the most common disorder found in the homeless. Before anyone gets up in arms, I am not suggesting that every person who finds themselves homeless is mentally ill. That is certainly not the case. More people than ever are finding themselves in this sort of situation due to the hard economic times we are currently experiencing. However, it is a possibility that I feel must be considered at this point. It certainly would explain some of the odd behaviors and theories being put forth by the couple. I have a good friend who is a long time police officer. He has had many dealings with the homeless over the years and he says, "Many, if not most, of the homeless I've dealt with have suffered from some form of mental illness or substance abuse problem." He went on to add, " Being a paranoid schozophrenic seems to be the most common ailment they suffer. Some of them have the most elaborate thoughts and beliefs on the federal government. The most common delusion is that they have had a chip implanted in their brain and are under constant surveillance by the authorities. However, you could discuss almost any other commonplace subject with ease and intelligence despite this fact." Interestingly, he said, "Despite their delusions this does not preclude them from being solid witnesses to a crime. Based on your report (blog entry below) it sounds like a very common scenario where they saw something real, were open and honest about it, yet are completely delusional in other aspects of their lives." I have no idea if this couple suffers from any form of mental illness. Due to behaviors exhibited and their circumstances it must be considered, no matter how politically incorrect it may be, as a possibility. So, what is my final conclusion on this one? Initially, as stated previously, I was leaning toward believing the sighting was real. The account was truly convincing and I did not detect any signs of deception. However, as stated in the original post , the odd theories the witness put forth during that first discussion gave me pause. My doubts have only grown stronger for the reasons stated above. Is it possible these folks saw a sasquatch on the outskirts of San Antonio, Texas? I absolutely believe it to be possible. Do I have enough confidence in this report to suggest publishing it on the TBRC website or to come out on this blog as believing it to be a legitimate sighting? I do not. There are simply too many reasons to have reasonable doubts on this alleged encounter. Last night I spoke to the lady who made the 911 call to San Antonio police to report a sasquatch sighting. I will go into some detail regarding that conversation but feel it would be beneficial for readers to hear the actual 911 call first. You can hear that call here. The witness sounds sober and coherent on the phone. She talks lucidly to the dispatcher and her request to have someone come out to the location to check things out seems reasonable to me. The witness did not want to meet an officer at that point in time. Some have criticized the witness for this or pointed to this detail as a sign the whole thing is likely a hoax. I am not so sure. As is clearly stated on the 911 call to the dispatcher, it was dark , raining, and the witness was too scared to walk through the wooded area to the nearest road where an officer could be met. This seems like a predictable and perfectly logical reaction to seeing something frightening, in my opinion. I also feel she must have been really shaken up to call the police as she and her husband would likely be forced out of their make-shift camp if police became aware of their exact location. I cold called the witness and once she warmed up to me she rattled off details in a rapid-fire fashion that was sometimes hard to keep up with. I learned she and her husband are currently homeless and living out of a tent in a wooded area on the West side of San Antonio. They have been staying in this particular area for several years. The husband was talking at the same time in the background during the conversation in the same rapid-fire fashion, which sometimes made the conversation even more difficult to follow. However, I was able to glean some additional details not published, that I have seen, anywhere else. She claims not to have talked to anyone else regarding this incident and that no one has visited the sighting location. This would seem to make some of claims of other investigators who say they have found tracks, hair, etc. dubious at best. The witness has a clothes line strung up that at her campsite that is, according to her, about five feet off the ground. She was walking near this clothes line when she noticed a large hair-covered upright creature staring at her from the other side of the line. She stared at it for a few seconds and then it bolted away from her, scooped up a deer carcass lying on the ground, and made its way into the brush. As it retreated, it let out a loud scream the likes of which neither the witness or her husband had heard before. 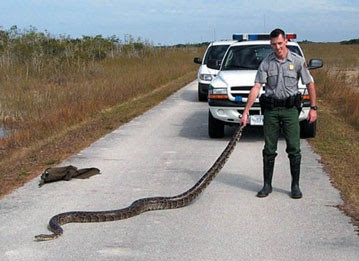 The witness estimates she was no more than 30 feet away from the creature initially. The point at which she lost sight of it was about 50 feet away. While it was dark, she had, in her words, "a pretty good fire going." This fire lit the area up enough to get a good look at the animal. She added that there had not been a deer carcass in that location earlier. She describes the animal as dark and covered in hair or fur. She is estimating the creature's height to be between seven and eight feet tall. She estimates this based on how much taller the animal was than the five foot high clothes line. It walked away very quickly on two legs. At no time was the animal ever on four legs. The deer carcass was picked up easily. The witness said, " It picked up that deer like it was nothing and tucked it under its arm like a football." She added, "It didn't even slow it down any." The husband corroborated everything she said. albeit from the background while she was trying to tell her story. The pair was very frightened by the idea something so large and powerful was in the vicinity and thought it best to call the police. The witness described some things that intrigued me. The first was how the creature stood as if frozen in place for several seconds. This reminded me a bit of a fellow TBRC members sighting account. This gentleman was out setting up a game camera in an area where there had been several recent sightings. He looked up to see a large dark animal looking at him from a brushy area. He felt the animal must have thought he had been spotted. This "being seen" is what prompted the creature to run away. The San Antonio witness similarly said, "It didn't move until it realized I had seen it." She seemed to feel if she had not "gawked at it" it would never have moved at all. The second thing I found compelling was the deer carcass. Sasquatches carrying deer, hogs, etc. have been reported before. What is interesting about this situation is that the deer was already dead and the location of the couple's campsite. According to the witness, dead animals are dumped in the area by, as she described them, "government trucks." If true, my best guess is that county or city workers are scraping up road killed animals and, instead of disposing of them properly, dumping them in this area. Why they would do this I cannot say. If true, this could explain why a sasquatch was in this semi-developed area to begin with. If these dead animals were dumped reasonably soon after being killed the area would be a continuous source of food for a sasquatch. It could stay hidden in this wooded area and wait for "deliveries" several times a week. Stories circulating about how the witness saw a sasquatch take and devour a live deer are not true, according to the couple. The third thing that was very interesting was the scream the witness claims the creature made as it strode away. She said it was not a howl like a wolf would make but a scream. She had a bit of trouble in trying to describe it and instead tried to duplicate it for me over the phone. It may sound funny, and, no doubt, totally unscientific, but her mimicked scream rang true to me. It dawned on me that I had heard that before. The scream she made was eerily similar to the scream described by TBRC members heard outside their tent in the Big Thicket National Preserve during Operation Thicket Probe several years ago. At least it was very similar to these members best efforts at recreating it. One more thing really made me sit up and take notice during our conversation. She claims, and her husband again corroborated, hearing loud banging sounds from time to time. According to the witness, they always seemed to come from the same direction. One day in the last week or so she and her husband decided to go try to find the source of the banging. She says they came across an old stump that looked like it had, in her words, "been beat to hell." Upon closer inspection, the couple found a hollow cavity at the base of the stump contained a beehive. She theorized that the creature was beating on the stump to get the bees to leave the hive so the honey could be accessed. 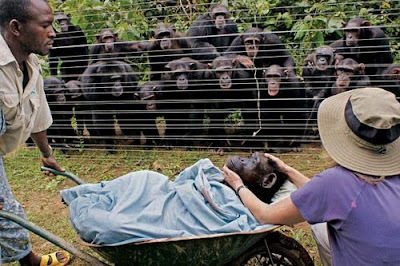 I'm not sure about the validity of her theory but do know that chimpanzees have been documented beating on beehives for hours at a time in order to break through and reach the honey inside. At this point, the witness really got worked up and went off on some tangents that raise some red flags for me. She claims that "government vehicles" have been driving all around the area since she called 911 and that sometimes they park for hours at a time. She says she has heard a very high frequency sound come from the vehicles during these extended stays. She feels that the sound is intended to flush the creature out of hiding. She also feels that there is a whole family of creatures in the area and that they are trying to "communicate with her by thinking" or, in other words, telepathically. She says she now can "feel" when one or more of these animals is close by and senses a "female presence" at times. The witness was very convincing when discussing the actual sighting and the accounts of the banging and knocks heard over the last few weeks. After digesting her account, I am leaning toward believing her story regarding the sighting itself. I admit to being troubled by some of the theories she extolled on telepathy, government involvement, and habituation. However, whether I agree with the witness' interpretations of the events or not is not relevant to whether or not this person actually saw a sasquatch. I feel that is an important point to stress here. I feel the monkey-like creature that visited a dumpster at a not too distant auto body shop is an entirely different and unrelated incident. By all accounts this small creature appears to be a macaque or similar small primate. I have no idea where this little guy might have come from but the location of his appearance and the timing of the incident appear to be entirely coincidental. So, there you have it. The whole thing could be one elaborate hoax, I suppose. An on site investigation is going to be necessary before I can go any deeper on this one. I hope to have the opportunity to visit the sighting location in the next week or two. I will update things when, and if, that happens. I am endeavoring to look into the alleged sighting of a "bigfoot-like" creature seen on the outskirts of San Antonio, Texas this past week. I have a friend in the area who is keeping me up on developments as they occur. I am also trying to get access to one of the witnesses who actually made one of the 911 calls. If I am successful in contacting this person I will likely be making a trip down south to visit the sighting location. I will post updates here as I have them. In the meantime, Loren Coleman over at Cryptomundo has done a good job of documenting the events surrounding this sighting to this point. 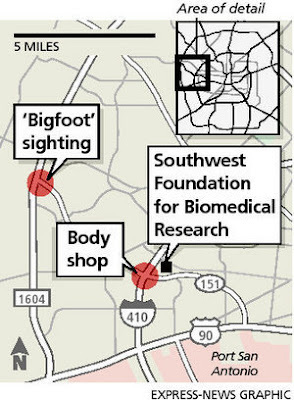 Here is a link to an article about several alleged sasquatch sightings in San Antonio, Texas. If anyone has heard anything about this please contact me. Loren Coleman has updated the story of the orang-pendek sighting in the rainforest of Sumatra over at his Cryptomundo site.I will not summarize it here as you are all capable of reading it for yourself. It is quite interesting. 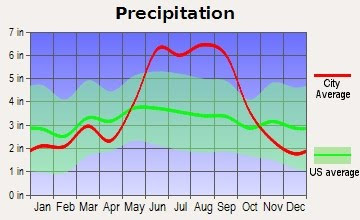 So far, things look promising. I just returned from the Texas Bigfoot Conference in Tyler, Texas. I've got to say that the line up of speakers was sensational. Attendees were treated to a virtual who's who in the field of serious sasquatch research. Some of the highlights are summarized below. Primate biologist Esteban Sarmiento gave a very informative talk on great ape anatomy. He discussed physical characteristics of chimpanzees, gorillas, bonobos, and orangutans and then compared what is known about these great apes versus physical characteristics and locomotion demonstrated by the sasquatch filmed by Roger Patterson and Bob Gimlin at Bluff Creek in 1967. 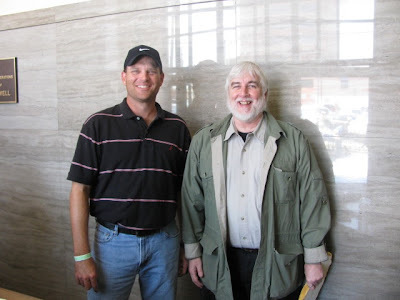 Baylor University sociology professors Chris Bader and Carson Mencken presented the results of two different surveys they undertook regarding the demographics of those who casually believe the sasquatch is a real animal versus those who seriously research the sasquatch phenomenon. This survey will be available soon online at the TBRC website and, hopefully, here on this site. The results were quite interesting and in direct contrast to the way researchers are often portrayed in the media. Wildlife biologist and naturalist John Mioncynzski spoke about the strategies he and Dr. Jeff Meldrum of Idaho State University are using in their North American Ape Project. He spoke about plant surveys which can help indicate if there is enough food in a given area to support an animal the size of a sasquatch, discussed advantages of gigantism for survival, and several other fascinating tidbits which really got me thinking about some ways to tweak existing research strategies. I was also privileged to hear about Mioncynzski's own encounter with what he believes was a sasquatch back in the early 1970s. This encounter was featured prominently on The History Channel's Giganto: The Real King Kong. His story of having his tent collapsed by the creature and then having pinecones lobbed at him from the brush for the rest of the evening was mesmerizing. 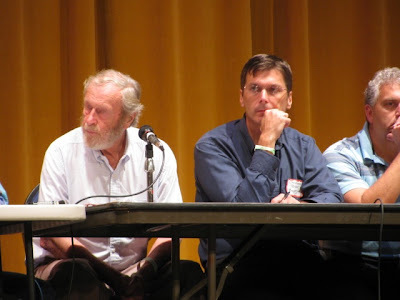 Maybe the true high point of the conference was the banquet that evening featuring adventurer, wildlife author, and naturalist Peter Matthiessen as keynote speaker. Matthiessen is revered by wildlife experts the world over for his research on the snow leopard of the Himalayas. Matthiessen held the audience rapt with stories of his adventures. He discussed his own sighting of what may very well have been a yeti in a remote and, at that time, previously unexplored Himalayan valley, his work with early bigfoot researchers such as John Green and Rene Dahinden, and his plans for writing a book on the subject of the sasquatch. It was truly a once in a lifetime chance to hear this man speak. Other conference speakers were Daryl Colyer, Alton Higgins, Jerry Hestand, Bill Draginis, Dr. John Bindernagle, and Loren Coleman. All of these speakers did an outstanding job and only added to the professional and scientific nature of the conference. One special treat was a guest appearance by none other than Bob Gimlin. Gimlin was present when Roger Patterson filmed what is generally considered the most compelling video evidence of a sasquatch ever captured. The film has been dissected ad nauseum over the years. It has supporters and detractors. For various reasons I've always felt it was likely genuine. Hearing Gimlin personally recount the events of that day was a once in a lifetime experience. 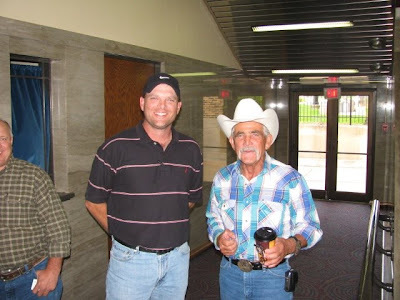 I can also tell you that Bob Gimlin is one of the nicest people I've met anywhere. The conference rejuvenated me to a large degree. It is so easy to become jaded and fed up with the shenanigans that go on in this field. 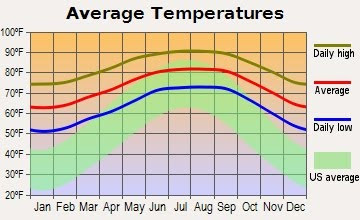 Things like the Georgia hoax, negative media portrayals of the subject, and Biscardiesque snake-oil salesmen hoping to exploit the phenomenon for a buck all take their toll on those of us who try to go about documenting this animal in a serious and scientific manner. It is so easy to become discouraged. I find the fire in my belly rekindled. I can't wait to get back out in the field. In addition, the conference gave me several ideas for future entries. I think, too, I will do a series of write-ups on "The Classics" of sasquatch encounters over the years. In addition, I would also like to do a series of write-ups on the most commonly used arguments used to dismiss the possible existence of this animal and my thoughts on whether said arguments are valid. So, I guess I will be hanging around and doing this a little while longer. It continues to be a fun ride. The report below was posted by Loren Coleman at Cryptomundo. If true, this could be a ground breaking event which opens the door to more extensive research on cryptids the world over. Let's keep our fingers crossed that the evidence Adam Davies brings home is strong enough to prove the existence of these creatures. I fought off some unseasonably hot September Texas weather and a stomach virus in order to go out check on Camera #3 this past weekend. I removed the old film, loaded the camera with a new roll, and refreshed the batteries. I had the film developed that afternoon and found I only captured photos of deer and a raccoon. I was excited, however, by the fact that the camera fired 89 times. I am limited to only 24 pictures due to it being a 35mm film camera but the number of shots triggered tells me that I am in a good spot with this camera. I might have done better as far as the variety of animals photographed if bad weather had not come through the area two days after I deployed the camera. The severe weather, no doubt, caused a lot of swaying of vegetation and trees which triggered the camera quite a few times. Unfortunately, this ate up most of the 24 exposures on the roll of film. I am quite curious as to what I missed once the camera ran out of film. I plan on upgrading to digital cameras as soon as possible. This spot will be where I place the first upgrade. I came across a fun post on The Gralien Report blog-site where the writer lists the five scariest cryptids in the world. None of the cryptids listed roam the Lone Star State but it is a fun post. I was especially interested in the "batsquatch" of Washington State. Supposedly, this creature was photographed. I will try to find online images of these photos. A big cat in the Frisco area may seem out of place when you google the location, but Frisco is one of the newest suburbs in the country. 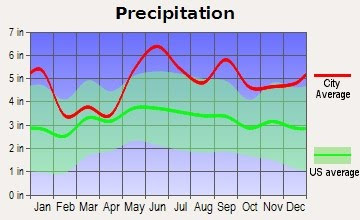 Just a few years ago it was a rural area, but it quickly began to grow. It grew so quickly thet Frisco was recognized as the fastest growing city in the country. However, there is one area of Frisco that would still make a good habitat for big cats. The location is called Brinkman Ranch, which is a several hundred acre area of land that also served as the original set for the television series, Dallas until the house burned and the set was moved elsewhere. However, this land is still private and unsettled. It would have been a likely location for any wild animals to flee to as residential neighborhoods sprung up all around the ranch. What throws a kink into this is the fact that a guy in a white truck patrols Brinkman Ranch every night, with a spotlight, and shoots at coyotes with a rifle. 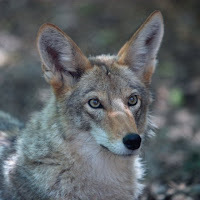 I have personally seen coyotes fleeing the ranch and heading into the suburban neighborhoods. So, with the only suitable habitat for coyotes and potential big cats being a kill zone, the animals have no choice but to move into the suburban areas which are a safer place to be, in this case, than the open fields and woodlands of the Brinkman Ranch. So it does not surprise me that a theoretical big cat would be seen in such a location as it was. The growth of the city from a rural area into a sprawling suburb has outpaced the average life expectancy of these animals. Therefore, there technically could be these types of animals that never made it out as the city grew around them. 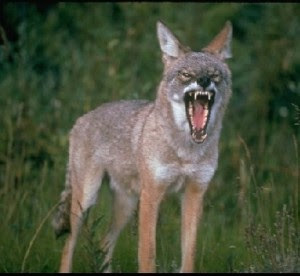 I've seen coyotes as far south as the north Dallas area along railroad tracks and running through neighborhoods at night. I think this reader makes some valid points as to how big cats, as well as other species, might find themselves "locked in" and surrounded by suburban sprawl. I think this is clearly a contributing factor in sightings of big cats in urban areas. I do think there may be more to it, however. As I stated in the original post on this subject, I believe that big cats may be making the same adjustment that coyotes have made so successfully. Namely, they are learning to live in close proximity to people. For example, a report of a 60 plus pound black cat was received by police in Wheaton, Illinois on September 9. Wheaton is a suburb of Chicago, one of the largest and most heavily populated cities in the country. A woman jogging in Northside Park with her large dog allegedly spotted a large long-tailed cat that, other than its black color, resembled a cougar. 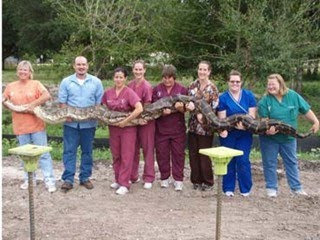 The woman judged the size and weight of the animal by comparing it to her 60 pound dog. The woman said the cat was bigger than her dog but fled when said dog approached it. According to the report, Northside Park is largely surrounded by homes but does connect to a swampy area called Lincoln Marsh. This incident shares much in common with the sighting my reader reported of a black panther in the Plano, Texas area. So, keep your eyes open and your cameras at the ready when out on those evening or early morning walks. You just never what you might come across or, as the case may be, what might come across you. Last night I was walking my dogs (we walk around midnight where I live in Lewisville, TX) and they let me know that there was something else nearby. I looked along the creek bank that was maybe 30 feet away and clearly some some kind of feline, maybe the size of a coyote, furtively running back the way we had come. It was lighter in color, so I'm guessing a bobcat or something. Anyway, it reminded me of an incident 2-3 weeks ago that happened when I was driving to work in Plano at around 9:00-9:15 in the morning. I had exited Hwy 121 and turned South onto Parkwood Blvd (East of the Dallas North Tollway - if you want to map it), and in the field to my left (now facing South), I saw a large, sleek charcoal-colored cat with a long tail running across the field toward the tree line that separates it from the field next to it. This thing was easily the size of a large dog (labrador, doberman, etc. ), and while it was "galloping", it was covering significant ground without noticeable strain. I only saw it for maybe 10 seconds or so before I lost sight (I was going about 30mph Southbound). Anyway, I don't have any evidence or anything more than what I've told you, but thought you might be interested all the same. Seems a bit of a populated area to be spotting something as elusive as a black panther, but then, for a couple of weeks we had a coyote couple hanging out in the field just SE of the intersection of Parkwood Blvd. and Tennyson Pkwy. in Plano (the field is a building now, but my office is on the 3rd floor facing it, so we had fun watching them in the tall grass before they cleared the field). I checked the area of the sighting out via google maps and it certainly seems an unlikely spot for a big cat sighting of any kind. However, the area is a bit unique in that there are fairly large tracts of what appears to be farm land interspersed among the many building and roads. I am assuming the tracts of land are being used for agriculture as when I switched to the "satellite" view of the area the land appeared to have been recently plowed. This sort of situation is becoming more common in Texas as urban areas sprawl outward. Some long time farmers in my area, for example, are completely surrounded by strip malls or housing developments yet refuse to sell and continue working their land. In any case, it has become clear that some predators have adapted better than others to living in close proximity to people. Coyotes are probably the most successful in this regard. Bobcats also seem to be making this adjustment. I have a theory that the larger cats have learned to do the same. Being solitary animals, large cats like cougars, jaguarundi, etc., could remain hidden fairly easily even in a somewhat urban setting. Creek beds, canals, drainage ditches, and riparian green belts could all serve as "highways" for these cats to move about. If they are moving primarily at dawn, dusk, or at night they are even more unlikely to be spotted. 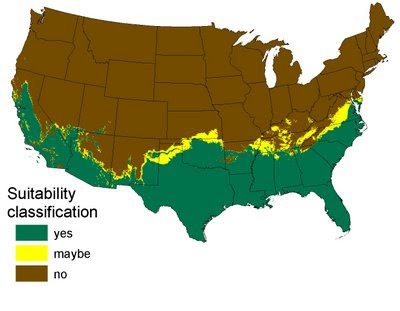 This is the hypothesis I am trying to verify with my current camera trapping project. Recently, the show MonsterQuest did a show on feral dogs called, I believe, The Real Cujo. The show centered around a pack of wild feral dogs living in abandoned buildings in a rundown section of St. Louis, Missouri. It made me wonder if large cats might not be able to do the same in some urban areas. Again, just a theory but it could explain at least some sightings of big cats in areas where they should not be. Many would consider this hypothesis, at best, highly unlikely. However, people are seeing big cats and they have to be coming from somewhere, right? My thanks to this reader for taking the time to contact me. I would be very interested in hearing from others who have seen big cats or other strange and/or unusual animals. I managed to get out and check Cameras 1 and 2 this past weekend. Camera 1 performed well. The entire roll of film was used giving me a total of 24 pictures. Unfortunately, no cats were photographed. While nearly all the pictures were of deer, I was encouraged to get a good photo of a coyote. 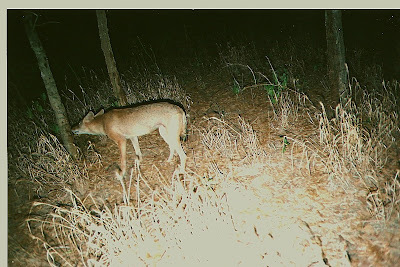 The photo, below, clearly shows the coyote sniffing a tree, which I had sprayed down pretty good with some scent bait. This would seem to indicate that the scent I have concocted does appeal to predators. I will continue to experiment with different scents and food baits until I get something that appeals more to my feline targets. The results from Camera 2 were a huge disappointment. I failed to get a picture of any kind of animal at all. You may recall, if you read my post after setting this camera out, that I was very excited about the location of this camera. I was really anticipating some good shots of local wildlife. I would have thought the camera was not functioning properly except it did snap several photos. Mostly, I got photos of the trail with no animal in sight. Whether these photos were the result of false triggers or near misses due to slow shutter speed I can't say. I was shocked to get a series of photos of a couple of hikers. I would not have guessed I would get any human activity in this spot at all. Fortunately, the hikers did not take the camera. As a matter of fact, judging by their position in the pictures, they never even saw the camera. I left Camera 1 in place with new batteries and film, as it has been very productive. I refreshed the batteries and film in Camera 2 and left it in place as well. Despite the lack of productivity it really seems like a perfect spot. If it produces nothing after four more weeks I will relocate it. I have found some great looking spots for future camera deployments in the same area. Camera 3 is due to be refreshed in two weeks. I really liked the spot where this camera was deployed. I hope it works out better than the location of Camera 2. 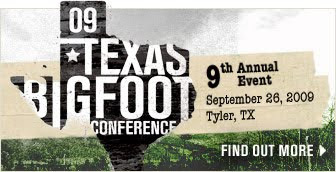 I just wanted to remind everyone of the upcoming Texas Bigfoot Conference coming up on Saturday 9/26 in Tyler, Texas. The conference will be held at the Tyler Caldwell Auditorium located at 300 South College Avenue. The contact number for the Caldwell Auditorium is 903-262-2300. The TBRC has lined up a very impressive group of speakers featuring wildlife author and naturalist Peter Matthiessen, artist Robert Swain, primate biologist Esteban Sarmiento, wildlife biologist John Bindernagel, Baylor sociologists Chris Bader and Carson Mencken, wildlife biologist and naturalist John Mioncynzski, video developer Bill Dranginis, and cryptozoologist, author, and zoologist Loren Coleman. TBRC members who will speak include Daryl Colyer, Alton Higgins, and Jerry Hestand. TBRC member Brian Brown will emcee the event and host a roundtable discussion Saturday night featuring all the guest speakers and TBRC chairman Craig Woolheater. General admission tickets will be sold for $15. Educators and students of the Tyler ISD will receive $5 off the price of admission with a school ID. The conference is truly a bargain for anyone interested in the subject of bigfoot. The conference is sponsored by the Texas Bigfoot Research Conservancy (TBRC). The TBRC is funded by membership dues, fundraisers, this annual conference, donations, and grants. 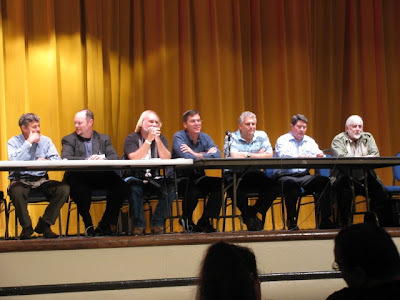 The TBRC desires to enhance the credibility of bigfoot/sasquatch research and facilitate a greater degree of acceptance by the scientific community and other segments of society of the likelihood of a biological basis behind the sasquatch mystery. The TBRC is a registered non-profit organization with the Internal Revenue Service. So, if you are in East Texas on September 26th drop on by the Texas Bigfoot Conference. It should be fun and educational. I will be there and would enjoy meeting and visiting with anyone who follows this site. I think this is a great philosophy and one by which I try to live my life. It is certainly easier said than done but I don't want to wake up one day at 65-75 years of age and regret not having pursued my passions and interests as a younger man. My thanks to my friend Alton Higgins for making me aware of this quote. Sasquatch Caught on Kentucky Game Camera? 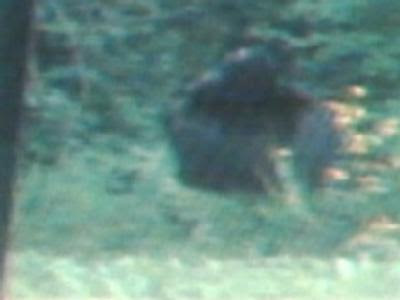 There is a new photo making the rounds on the internet that was allegedly snapped by a game camera in Kentucky. Many are speculating that it could be a photograph of a sasquatch. I must admit that, while inconclusive, it is a bit more intriguing than the usual "blobsquatch" photos that have become too common. Below is the news story about the photo and how it came about. I'm not sure what appears in the photo. It just isn't clear enough. I do feel it, once again, shows how game cameras could be used to eventually document this species. Assuming the sasquatch is real, and I believe it is, it is just a matter of time until a clear photo is taken. Now whether a photo will be enough for mainstream science to recognize the existence of this animal is another question. 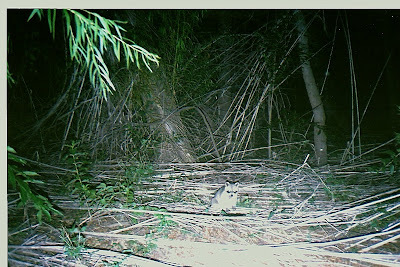 I just returned from deploying a game camera in a remote spot forty minutes or so West of my home. I now have four cameras out in the field in an attempt to document big cats here in Central Texas. Things got off to a poor start today as one of the two cameras I had left to deploy would not work. So, instead of having five cameras out in the field it looks like I will only have four. I will not be able to expand the project beyond these four cameras for the time being. I am not as pleased with the location of this camera as I am with the spots I found for the first three. The general area is a bit farther from a water source than the other three and more of a prairie than anything else. The area is dotted with stands of oak, mesquite, and cedar trees. This in and of itself isn't really a problem. I just couldn't find that perfect spot. When the area looked right I couldn't find a suitable tree. I hiked the general area for several hours and just never found a location I was crazy about. There are obviously some things to look for when choosing a spot for a game camera but there is also an intangible "something" that is hard to define. You just know the perfect spot when you see it. I never saw that spot today. I came close to not deploying the camera at all but figured I still had a chance of getting a good picture at this location. One thing I do know is that my chances of getting a good shot with the camera back in my closet at home are nil. I will give this location a month. If nothing promising develops I will pull the camera and relocate it. I will post some pictures of the general area where this fourth camera is located in the next day or so. Honestly, I am just too tired to do it right now. I have listened to and read the theories of M. K. Davis now for a couple of years. I have watched his "documentary," Spotlight on: The Patterson-Gimlin Film, with incredulous bemusement. I found it unbelievable that anyone could buy into Davis' wild and unsubstantiated theories. However, I left it at that. I never bothered to comment, at least publicly, on Davis or his ideas. Davis was, in my opinion, just one of those people this subject seems to attract who was either totally delusional or an outright charlatan. Surely, I thought, no sane person would buy into any of the craziness Davis was promoting. Sadly, I was mistaken. That being the case, I can no longer sit idly by and say nothing. M. K. Davis gained notoriety for his work in "stabilizing" the Patterson-Gimlin film. His work helped provide the clearest version of the Patterson-Gimlin film yet seen. However, the way he went about obtaining the images to stabilize should have provided ample insight as to what sort of person M.K. Davis would turn out to be. Davis used images illicitly obtained from well-known researcher Rick Noll to create his stabilized version of the film. Noll had spent countless tedious hours pouring over John Green's copy of the Patterson-Gimlin film. He photographed the sasquatch in each frame of the film using a microscope. The images Noll's efforts rendered were the clearest and sharpest ever seen of the creature that would become known as "Patty". Davis obtained Noll's images on the sly from a third party with whom Noll had shared the images. Without these images, the "stabilized" version of the Patterson-Gimlin film would not have been possible. The unprofessional and unethical method by which Davis acquired the images seems to have been forgotten, or forgiven, by most. Perhaps, most feel the end justified the means. I would simply say that, in my opinion, there is no right way to do the wrong thing. 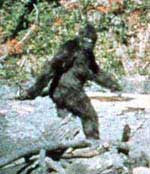 Davis went on to make some outlandish claims based on what he was able to see in his new and stabilized version of the Patterson-Gimlin film. Here are a few of the claims made by Davis based on the "evidence" now visible because of his work: the sasquatch was obviously some type of human, a top-knot and braid were clearly visible on the top of the creature's head along with a bone hair clasp, the sasquatch was carrying a stick, thus, it was obviously a member of a remnant tribe of, in his words, digger Indians that still inhabited the Bluff Creek area, an anomalous bulging visible on the creature's thigh proved that it had been shot, and the way the sasquatch moved its head at one point in the film showed it was dodging a bullet or bullets still being fired at it by, presumably, Bob Gimlin. In addition, Davis claimed the shape of the creature's head in the film was the result of a head binding technique practiced by some Native American tribes in years past. Watching his version of the film, I was unable to see anything that justified these claims. Davis, in his documentary, went on to theorize that sasquatches were actually descendents of Asian yetis captured by the Chinese in ancient times. The Chinese, according to him, were exploring the world on massive junks and using the sasquatches as slave labor when some were released or escaped onto the North American continent. Are you beginning to get the picture here? This is stuff I could not make up if I tried. As I mentioned before, I chuckled a bit, shook my head, and did not give M.K. Davis much more thought. After all, his theories did not harm anyone. The only person who seemed likely to be harmed by this foolishness was Davis himself. It was his legacy that he was endangering by promoting these wild theories. Now, I'm afraid, Davis has taken things to a whole new level. He has come up with a slew of new and increasingly illogical theories based on what he sees in a film he claims was shot at the same time as the Patterson-Gimlin video. Davis claims this film proves there was a massacre of numerous sasquatches at Bluff Creek and that well-known researchers John Green, Bob Titmus, and Rene Dahinden, along with Roger Patterson and Bob Gimlin, were involved in a massive cover-up of the event. Davis makes these accusations based on "evidence" he found when he manipulated the film. It seems he intensified elements of red in certain spots on the film to reveal blood on the hands of those present and huge pools of blood on the ground. Davis even claims to have spotted a sasquatch skin and a ribcage in the film. The ribcage and skin I just don't see. The pools of blood and the red on the hands of the investigators? Well, I'm no expert, but photo-enhancing software is pretty standard on computers these days. You can toy with shading, spectrum, sharpness, and contrast to produce a radically altered image if you so desire. Anything with elements of red, orange, purple, tan, or brown can be altered to appear red quickly and easily. You can read more on the theories of M.K. Davis over at Cryptomundo. Loren Coleman has done a very good job of documenting all this nonsense in great detail. So why do I feel compelled to speak out now? Several reasons, I suppose. First, and foremost, this newest round of foolishness impugns the character of others. No longer is Davis hurting his own reputation only. Now he is attempting to smear the reputations of others. It isn't right. Roger Patterson, Rene Dahinden, and Bob Titmus are all dead. They can't defend themselves. John Greene is one of the most respected researchers of this subject of all time. Bob Gimlin is a nice man who does not deserve this. He has endured more than his share of grief due to his being present that fateful day in 1967. Another reason I felt it was time to speak is that sometimes ignoring a problem does not make it go away. A cancer left untreated will spread and consume the entire body. The cancerous poisons that are the theories of one M.K. Davis need to be removed from the body of this community. Finally, and perhaps the simplest reason is that the greatest sin occurs when good men do nothing. I can do nothing no longer. I think there is one more reason for speaking out. The field of cryptozoology is considered a fringe science at best. With people like M.K. Davis running around spewing nonsense we cannot hope for anything better. It is time for those of us in this field to say enough is enough and expel the whackos from out midst. No other scientific discipline would accept delusional rants as fact and not require some sort of actual proof beyond doctored bits of film and stills blown up so large they are just pixelated messes. If we continue to harbor the delusional and the charlatans the field will never be taken seriously. Our standards must be higher. It has been said that extraordinary claims require extraordinary evidence in order to be believable. Fair enough. I accept and support that in regard to proving the existence of these incredible animals. We must demand the same standard of proof of M.K. Davis in regard to his hurtful accusations and wild theories. 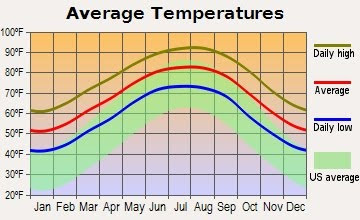 I am not a well known researcher or scientist. Probably only a few dozen people will read this entry. That is ok. I've now done what I can to alert people to the crazy snake oil that M.K. Davis is selling. I will not be silent while the reputations of good men are soiled by baseless nonsense any longer.